The 2 lovely lass above are Japanese dancing net idols, Aikawa Kozue on the left and Ikura on the right from DANCEROID, a 5 members girls dancer group well-known for dancing to popular Vocaloid tunes on YouTube. 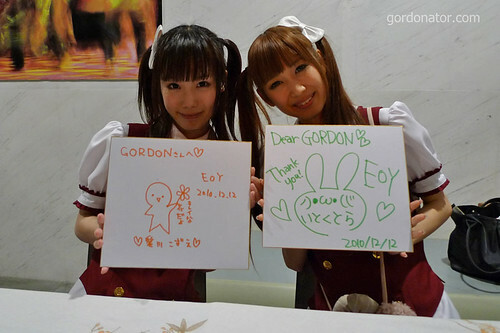 Both were in town last weekend as special guests for EOY, a major cosplay event over here. First heard of Danceroid was through Kozue-chan’s dance of Renai Circulation, the Nadeko’s OP for Bakemonogatari. Too cute for words! ❤ See below. Though I think they are more active in Nico Nico, anyone interested can check out their youtube page here. Their blogs and twitter are listed there too. Kozue-chan’s youtube page is here. Originally wanted to get the shikishi myself but the Takashimaya branch don’t have! >< so have to get Ethan to get for me at Bras Brasah branch as I was at STGCC whole day on Sunday. Its common for Japanese artists to sign (or draw) on shikishi so there's where the idea came from. Next time i should buy one as well. waa you made them do that for you ??? Yup. You left early on Sunday? You didn’t see? I really, really, really wanted to see Kozue perform Renai Circulation. Kozue is pheonomenal! I have been following her for years now! She deserves more fame I think for her talent..such a powerful and professional dancer for her age!! I also now follow KimonoTime too! She has been claimed by the views as the british kozue! She only started posting videos in september but she is doing very well. Her energy and smile and dances are very simukar to Kozue’s, you should check her out!